MANHATTAN, Kan. – Kansas State’s senior trio of Barry Brown, Jr. (18), Dean Wade (12) and Kamau Stokes (9) combined for 39 points to lift the Wildcats to a 74-67 win over No. 13/14 Kansas in the 290th edition of the Dillons Sunflower Showdown in front of a sold-out crowd of 12,528 at Bramlage Coliseum on Tuesday. With the win, K-State (17-5, 7-2 Big 12) ends an 8-game skid against Kansas, winning its first contest against the Jayhawks since 2015. The Wildcats have now won 7 consecutive games in Big 12 play for the first time in nearly 10 years and the first time since also winning 7 in a row from Feb. 2 to Feb. 27, 2010. K-State used a resilient effort that saw the Wildcats lead for nearly 29 minutes, that included a clutch effort in the waning minutes of the game. With under two minutes left, junior Xavier Sneed knocked down a contested 3-pointer in the corner that gave the Wildcats a 6-point lead (67-61) with 1:15 left, before sophomore Cartier Diarra came through with a steal and windmill dunk in transition that would essentially put the game away with 48 seconds remaining. The all-around K-State effort included the Wildcats shooting 43.1 percent (25-of-58) from the field in the game, while connecting on 41.7 percent (10-of-24) from beyond the arc. The 10 3-pointers were the fifth time this season the Wildcats have achieved the mark, including the second in a row. Brown had a game-high 18 points on 5-of-10 field goals to go with a game-tying 5 assists, 4 rebounds and 2 steals in playing all 40 minutes, while Wade added a near double-double with 12 points and a game-high 9 rebounds to go along with a game-tying 5 assists. Joining Brown and Wade in double figures were Sneed (14) and Diarra (11), as the Wildcats moved to 7-1 this season when four players or more scored double digits. Kansas (17-6, 6-4 Big 12) suffers its fourth-straight defeat on the road, as the Jayhawks fell to just 1-6 on the road. The Jayhawks were led by 18 points from junior forward Dedric Lawson, who also added a team-high 9 rebounds. Stokes got the scoring started early for the Wildcats, nailing a 3-pointer on the first K-State possession of the game, assisted by Wade. Back on defense, Stokes came up with a steal and layup in transition to give K-State a 5-0 lead within the first minute of play. The run played into a 14-6 early lead for the Wildcats that led to Kansas taking a timeout with 16:30, at which point the Wildcats connected on 6 of their first 7 shots from the field. Over the next six minutes, Kansas drew back to within 3 points at the 8:04 mark of the first half behind 6 points from freshman guard Devon Dotson and junior forward Mitch Lightfoot. Kansas would later take their first lead of the game at 29-26 with 4:41 left in the half on the strength of an 11-0 run. Kansas broke down the Wildcat defense in the first half, holding them scoreless from the field for 9:20, as the Jayhawks went into the half with the 33-30 lead. In the first 10 minutes of play, K-State shot 64.7 percent (11-of-17) as compared to the final 10 minutes, where they shot 7 percent (1-of-14). In the second half, the Wildcats relied on seniorsBrown and Wade to claw back into the lead, as the duo combined for the team’s first nine points in the half, putting K-State ahead 39-36 with 16:37 left in the game. With the lead at 4 points, Sneed and Diarra connected on a pair of 3-pointers, with a Kansas layup in between, that gave K-State a 50-42 lead just under the 12-minute mark of the second half. 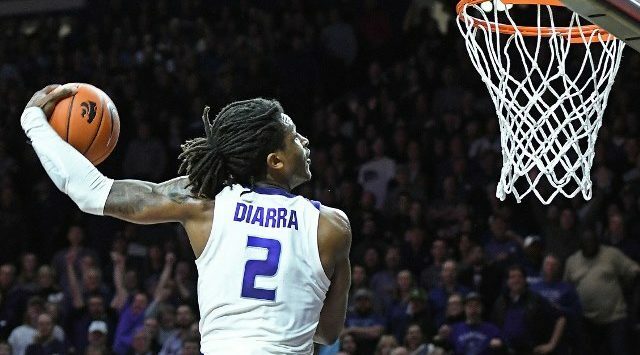 Diarra came up in the clutch for the Wildcats late in the game, knocking down a contested 3-pointer in the corner to give K-State a 5-point advantage with 4:19 remaining. On the other end, Diarra collected a Kansas miss and pushed it into transition, resulting in a layup by Brown to extend the lead to 7. After a 5-0 run from the Jayhawks to bring the score to 64-61 with 1:42 left in the game, Sneed came through with a clutch 3-pointer in the corner to give the Wildcats a 6-point lead with 1:15 left. With under a minute left, Diarra iced the game with a steal and windmill dunk in transition that brought the score to 69-61 with 48 seconds left. On the next Kansas possession, Wade came up with another steal which sent Brown to the line, where he canned two free throws to bring the score to 71-61 with 33 seconds left. Kansas would connect on two 3-pointers in the final of play, before the Wildcats were able to dribble out the clock, as the Wildcats prevailed, 74-67. Xavier Sneed – Leading another K-State barrage of 3-pointers, junior Xavier Sneed scored 14 points on 5-of-11 from the field, including 3-of-6 from beyond the arc and 7 rebounds. Sneed came through in the clutch with a 3-pointer to give K-State a 6-point lead with 1:15 left, leading to the K-State victory. 8 – With the win, K-State snaps an 8-game Kansas winning streak that dates back to 2015.